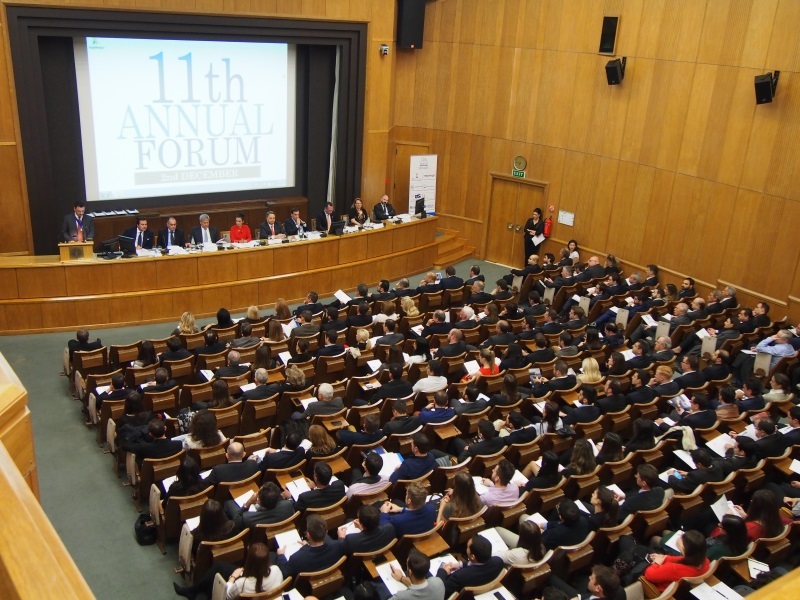 In an extremely well-organized event, the Institute of Chartered Shipbrokers, Greek Branch held its 11th Annual Forum, on Wednesday, 2nd December 2015, at the Eugenides Foundation. The title was: «View from the bridge: Shipping faces cloudy horizons» and the Forum was well attended by over 400 shipping professionals - from the Greek and International shipping community - covering all spectrum of the industry. Mr. Leonidas Demetriades - Eugenides, Chairman, Niver Lines Shipping Co S.A.
Mr. George Gourdomichalis, Managing Director, Phoenix Shipping & Trading S.A.
Mr. Simon Ward, FICS, Director, S&P, Ursa Shipbrokers S.A.
Mr. Vasilis Chakos, FICS, of V. Chakos & Co. Marine Claims Adjusters & Consultants was the panel moderator. Mrs. Natalia Margioli - Komninou, in her welcome address, opening the 11th Annual Forum of the Institute of the Chartered Shipbrokers, Greek Branch, highlighted the need for well-qualified and well-trained professionals, equipped to counter economic, operational and structural challenges that the shipping market is facing. The continual rise in numbers of ICS students and members suggests that professional qualifications are even more important today, as both companies and professionals are preparing themselves for when the market turns. She went on to mention that, the Institute of Chartered Shipbrokers excelled once again this year and won the BIMCO Education and Training Award 2015, in recognition of its investment in new learning, growth in students and graduate numbers and innovative teaching techniques. She also mentioned that ICS Greek Branch is once again the largest examination centre in the world with candidates that excelled in their exams and achieved important awards. Finally, she promised that there is more to come, mentioning the Hellenic Management Centre's prestigious collaboration with Queen Mary University of London to offer the LLM in International Shipping Law (Piraeus, Greece), which was successfully launched this year. Mr. Nicolas Tsavliris, the Chairman of the ICS Greek Branch and of the Tsavliris Salvage Group unfortunately could not attend this year as his business commitments have taken him to the U.S., but he addressed the Forum with his welcoming note on video. The International Chairman of the Institute of Chartered Shipbrokers, Mr. Michael Taliotis, FICS addressed a warm welcome to the attendees of the Forum. Mentioning the ever falling indices and pessimistic forecasts of the current shipping market, he expressed the opinion that the rise in numbers of ICS is one of the positive things in the industry. He made a reference to the specific figures as well as the BIMCO Education & Training award 2015. He congratulated the ICS Greek branch on its accomplishments, focusing on the impressive growth numbers, students' success and distinctions and surpassing London for the 2nd time in terms of student numbers. He then underlined that ICS is internationally the most recognised body offering such qualifications for more than 100 years, through an examination process, that proves that its members can meet high standards of education. But it is not only education. ICS Bye Laws are based on ethics. With the motto 'our word is our bond' ICS does not only equip shipping practitioners with high standards of education, but also with an ethical approach to the shipping business. Mr. Leonidas Demetriades - Eugenides, Chairman of Niver Lines Shipping Co S.A. introduced and put into context the topics discussed in the Forum. He reviewed the existing financial conditions worldwide commenting on recent events in Europe but also on the Asia factors focusing on the need for strong leadership and strong policies for the economy to grow. He went on to review current conditions in the shipping market and said that although we seem to be facing deep depression, Greek shipping always finds a way to be innovative and to emerge stronger after each crisis. He finally congratulated ICS Greek Branch on providing the shipping industry with skilled professionals, a demanding sector where there is no room for mediocrity. Mr. George Gourdomichalis, Managing Director of Phoenix Shipping & Trading S.A., expressed his feeling that it is not such a pleasure to speak about today's dry bulk markets as we are bouncing along on historical lows. He went on to explain that "View from the Bridge" in navigational terms requires that the master in command has a full view ahead of him and on both of his sides, today we, unfortunately do not have a clear view, the horizon is very cloudy and shows that we are experiencing serious "rolling". He further said that owners' view is determined by negative news from the world, existing investments and projections, commitments which need to be seen through and satisfied regardless of the market among other important factors as well as psychology which is currently off the charts and in very negative territory. He view on the horizon was over supply of tonnage, lacking demand for tonnage, a slowdown in world GDP and trade, uncertainty in China and the emerging economies and regions and geopolitical instability. He proposed reducing supply by cancelling new buildings, postponing new buildings, not putting in new orders and recycling, to help clear the view of the horizon. He concluded by urging the audience to watch the view from the bridge at Arthur Miller's 1955 Play, set in the Brooklyn Docks and look for the silver lining at the ending. The Managing Director of Seascope Hellas S.A. and Chairman of the Hellenic Committee of Lloyd's Brokers associates, Mr. Manos Lorentzos, presented the view that regarding claims, inflation is expected to grow for the next ten years and highlighted the hull claims trends by referring to claims frequency, total loss frequency and claims costs excluding total losses. He commented also on major losses for 2014/2015 and continued to explain Hull Portfolio Trends, drawing conclusions for Hull Insurance. He concluded mentioning that uncertainty seems to be the only constant in marine insurance as well, while strong M&A activity in the specialty re/insurance space will translate into: a. further globalization of marine insurance capacity and potentially offer diversification opportunities for specialized players and b. allow talent to move around in the market place and broaden knowledge about new and emerging risks. Mr. Lars Juul Jorgensen, Managing Director of Lorentzen & Stemoco (Athens) Ltd, talked about the Dry Bulk market being in challenging times with the BDI at historic low level, only seen before in Feb' 2015 and in Nov' 1986. The Bulk fleet has out-grown the current basic demand, whilst China's economy is adapting towards a consumer driven model with a slower but still growing economy, all impacting Iron Ore and Coal pricing with Chinese steel production being in a glut. He went on to explain how low commodity prices are putting pressure on high- cost Mining and Steel producers, impacting the bulk trading patterns. His view was that Grain markets have a stable demand whilst coal continues to fluctuate. Can India, being the biggest coal importer, become a stable component to balance the Bulk market? To improve current supply & demand high level of scrapping is required. Ships "scrapping age" is going down, and ships of 15 years or older have become scrap candidates, as freight rates are continuing being below OPEX levels. He concluded by asking when will owners with modern ships start lay-up their tonnage? With the major downward changes in commodity and freight rates counter-part risk assessment of Owners and Charterers are heightened, and increased with rumors of major trading houses facing potential financial restrictions. Michael Talios FICS, Institute Chairman, Institute of Chartered Shipbrokers, Natalia Margioli FICS, Managing Director ICS Greek Branch/HMC, Prize Winner Iro Tegou, Timagenis Law, LeonidasDemetriades - Eugenides, Chairman, Niver Lines Shipping Co. S.A.
Ms. Susan Oatway, FICS, Lead Analyst for Drewry Maritime Research explained how the gloomy outlook for the dry bulk market continues to besiege owners and mentioned that Drewry does not expect the market to return to profitability before 2017, as many owners are still struggling to recover their costs. The recent trouble in the market is more demand-driven than ever before with a bleak outlook for the short term. Her presentation looked at the key issue of dry bulk demand and where the expectation for growth might be. She expressed the view that the iron ore trade will grow moderately, in the range of 3-4% over the next few years; however, coal imports to China have slowed down and a rebound is not expected any time soon. Finally, she discussed the supply of bulk carriers to carry this cargo, as high demolitions and low deliveries hold the key to future supply issues. Twenty-four million dwt of capacity has already been demolished this year and a similar trend in the near term will ensure that supply will no longer be an issue over the next four or five years. The presentation finished with Drewry's short term outlook for the market and charter rates. Mr. Simon Ward, FICS, Director of S&P at Ursa Shipbrokers addressed the current state of the tanker market, concentrating on the crude and petroleum products sectors. He highlighted that the main cause for the current good health of the freight market has its root in the decision of OPEC to maintain production levels causing a fall in the price of crude oil to under $50 a barrel. This has stimulated demand for tankers, both for shipment but also for offshore storage. It is offshore storage, either for arbitrage or simple cargo storage which complicates the picture of the future health of the market. End user demand by the consumer has not been stimulated in any significant amount by the fall in the price of crude oil, and as such the future good health of the freight market is in doubt. This seems to be borne out by second-hand hand and new building prices which have not moved that much in response to improved freight rates. Once again, the year's proceedings closed on a celebratory note with the award ceremony, where candidates that participated at the April 2015 ICS Examinations, were honoured for their outstanding performance. The candidates distinguished internationally were: Mr. Ioannis Domvros of D. Rediadis Law Office, Mr. Zacharias Kapelakis, Ms. Kyriaki Kresta, Mr. Petros Sachperoglou of Harren & Partners, Mr. Anton Shpakevich of Seapower Maritime Inc, Ms. Iro Tegou, and Mrs Marialena Zoitopoulou. AB Maritime INC, Capital Ship Management Corp., Chios Navigation Hellas Ltd, Clarksons Platou Hellas Ltd, Eastern Mediterranean Maritime Ltd., Element Shipmanagement S.A., European Product Carriers Ltd, GAC Shipping S.A., Horizon Tankers Limited SA, Seanergy Maritime Holdings Corp, Springfield Shipping Company Panama S.A., Target Marine S.A., The Marshall Islands Registry, Tsakos Energy Navigation Ltd, Tsavliris Salvage Group, Ursa Shipbrokers S.A.